Back in September, we got to trial the TAG60. Sworn to secrecy we kept our thoughts under wraps until she completed a European show. It’s 38 degrees and I’m standing on a dusty industrial concrete dock on the Mallorcan shipyard. Behind me was yet another faceless towering megayacht, ahead of me the beautiful J-Class Vasheda and bobbing lightly in between chomping at the bit is Stardust, the latest the TAG 60. Normally very little starts the dock talking. These crews have seen them all, the biggest, the lightest, the fastest, the most exotic yet there has been a lot of chat about the TAG over the past week since her arrival. Crews who would normally look straight past a 60 foot catamaran are actually paying attention and it’s easy to see why; this is a very different catamaran with a rig that can’t be ignored. Years ago I remember a number of Heinekens and a conversation with TAGs Tim van der Steene. 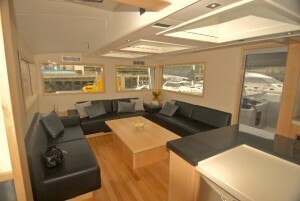 At the time we were hard-working charter skippers frustrated at the lack of room on our 60 foot cats. The sliding salon door was like the Berlin Wall -you either were a resident of the Salon or the Cockpit, but not both. Roll forwards 10 years and here I am sitting in the area that is normally the cockpit but I’m in the salon. Or am I? because if the large surrounding windows are dropped (push button) I’m in a cockpit. I’m confused and to add to that I’m unusually cool. It’s 38 and I know the air conditioning isn’t on. The coach roof is thick and obviously full of insulation, there are glass panels there too but no heat is coming through. There is a breeze all around me and I have a 360 view. I can talk to the whoever is cooking or whoever is helming. Interior of the hulls have a traditional 3 or 4 cabin layout that you would find on some of the better equipped but ultimately heavy and slow charter yachts. Intelligent use of interior design and no cost cutting on materials has given the same levels of luxury seemingly without loss of performance. Beds are in the hull not up a set of steps and stuffed in the nacelle. Ensuites are roomy with separate showers. There is plenty of light flooding in and the whole areas is clean, fresh and quiet under way. Nicely done. This was a reassuringly uneventful boat under engine as we motored out of harbour. She’s quiet, accurate and responsive. I actually question this owners choice of traditional engine and genset specs, he’s a performance biased coastal sailor and I think would benefit from the diesel electric options. These would mean he would never need to run an engine to leave the dock for his afternoon thrill-fest. Using energy recovery and intelligent battery systems he could actually carry on across the Atlantic without using a drop of fuel. Note: TAG have told me that while they have offered this technology in the past they are unsure that the industry is quite ready at this stage. This cautious approach to proven engineering is not, however, apparent in the rig. 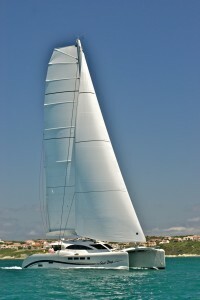 Stardust is an XR version, that means more mast, more sail. Of course within design parameters any builder can add a bigger stick (many have had to when their new cats rolled off the production line a little heavier than anticipated!) but the key to pulling an extra 25% of power out of a big roached fully battened main is a rotating mast. 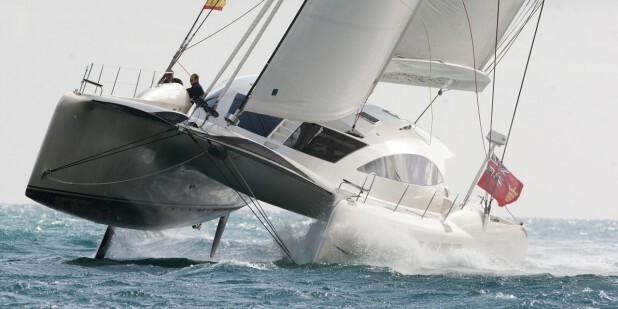 If a rig could have a turbo charger, this is surely it and camber becomes the preoccupation of the skippers mind. All controls are remote via a hydraulic system meaning the constant tweaking that this, former Olympian, owner wants to do is all done via hugely intuitive joystick. 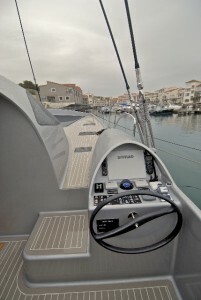 To eliminate any chance of human error, the skipper can select a preset limit to the performance of the yacht. Once these are reached the yacht trims automatically. To keep performance within preset parameters (ranging from ultra safe passage-making to full-on hull flying yee-ha) Critics of progress will rightly point out that depending on load sensors throughout the rig and hull and sophisticated electronics is a risky business I’m pained to have to point out that these sort of gizmos keep 747s in the sky and even the most budget of airlines seem to have no issues with them, however it’s easier to note that there is also a fully independent mercury based system hidden in a moisture free box somewhere within a bulkhead. Happy? The hull like most things aboard is full carbon. The decks offer complete walk around with no ducking or dodging. All sailing activity happens behind high bulwarks in the pits -really safe offshore. There is always shade -as a 12 year veteran of Caribbean sun let me tell you this is a big deal! 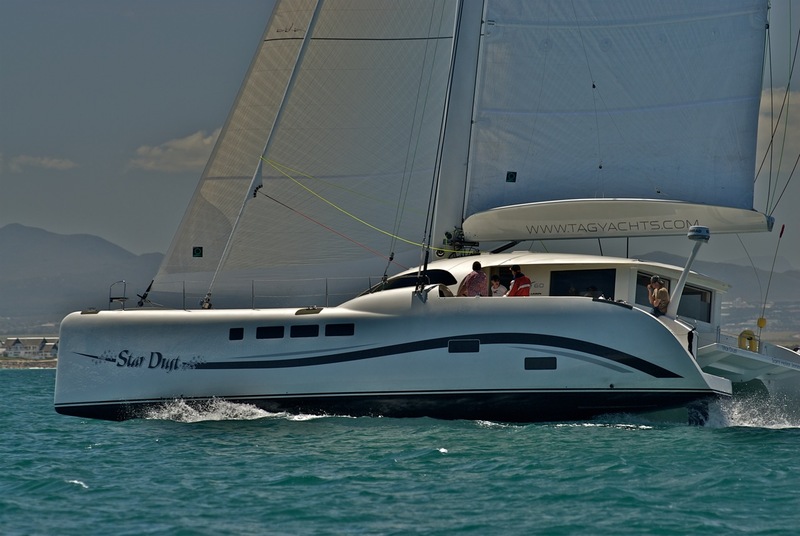 TAG have completed the offer of the 60 foot world cruising Catamaran genre making the choice for the potential Cat owner stepping into our virtual Catamaran superstore pretty clean cut. ’Where would Sir like to drive from? Bulkhead? 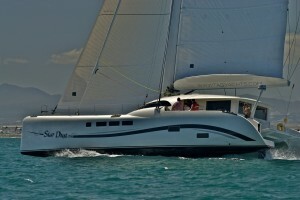 That’ll be isle 5’ Unlike any of the competition BUT just like some of the most successful big racing multihulls the TAG 60 has mid-ships mounted twin ‘Fighter’ cockpits. The competition will all claim to have the best helm position and we’ve handle the pro’s and con’s in a previous article. The fact is, all boats under sail have blind spots. Few, unlike the TAG, have recognised this and created a totally safe walkway between points of view. 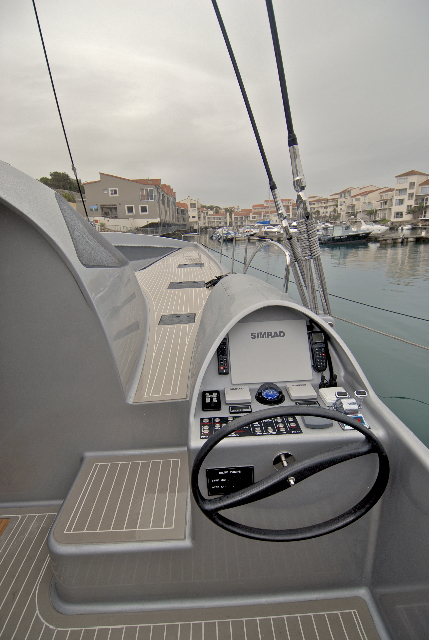 Just in front there are twin hydraulic daggerboards which allow for constant tweaking even under load. Steering is surprisingly not hydraulic but car style solid link. It offers great feedback to the helm and minimizes possibility of complete failure. Docking is a breeze with twin controls and excellent visability. Without doubt, helming from a fighter cockpit on a high performance cat like this got me grinning. I’ve sailed many, many thousands of miles in all possible layouts of Cat and I really, really get this. 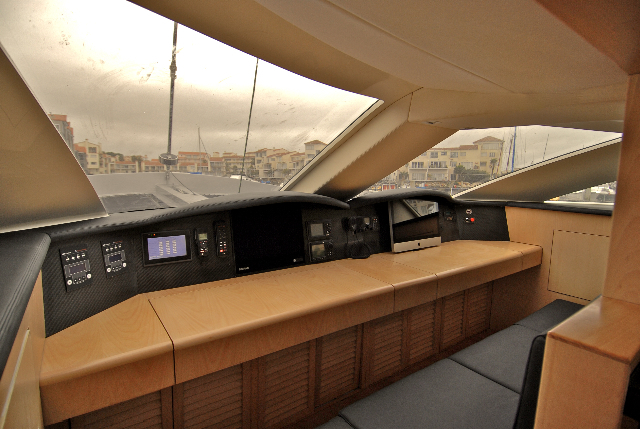 Once offshore, perhaps on a night passage, why not pop inside to the passage helm, taken directly from a motor yacht flybridge and spend your watch in the warm and dry? You have close to full 360 degree vision plus the position under the pitched windows and moonroof means you can clearly see the sails as well. Sat low you are looking along the level of decks and nets and more importantly -and this is a big one folks, UNDER the jib not AT it. 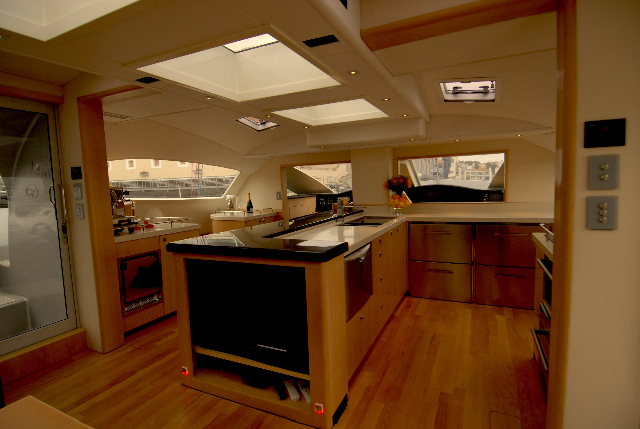 This helm uses an area that on most other Catamarans is dead space behind furniture. It’s genius. 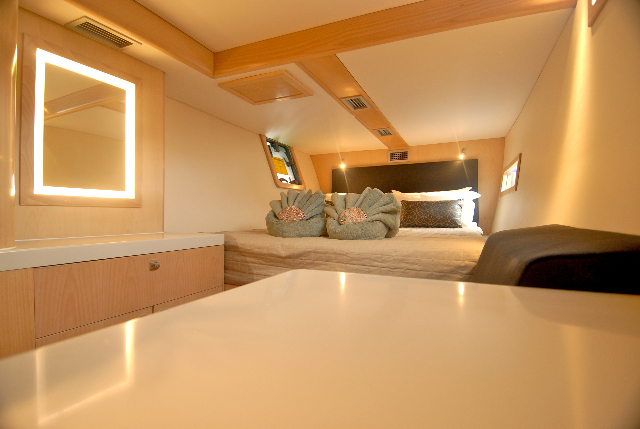 And very comfy genius at that…. Having read all this you might not be surprised to hear that this is a quick boat, that’s pretty obvious. The important detail is that this is designed to be a quick boat with a couple running her. The GT version with its standard rig might make them a little keener to sail around the corner to the next bay as opposed to motoring but that’s always going to be the Achilles Heel of a complex rig -powerful and exhilarating but a bit more of a pain to set. From the stats the GT looks quick and easily capable of safe and controlled 300+ mile days so a great round the world yacht. 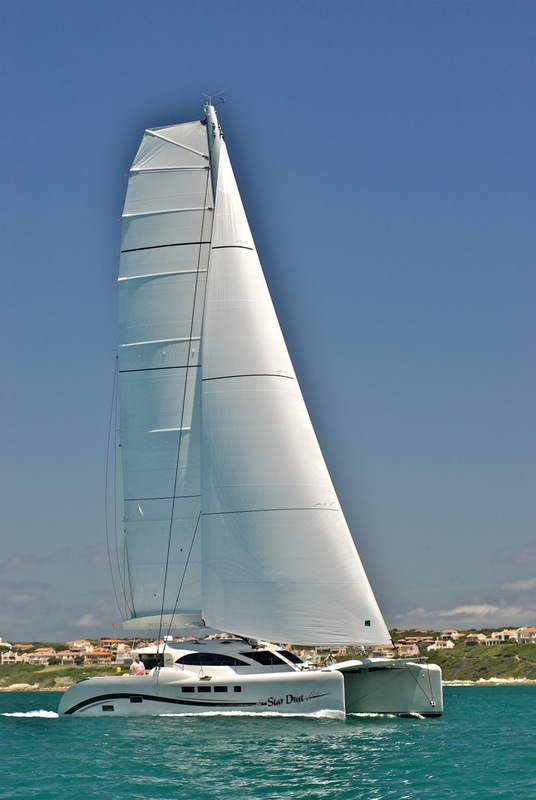 The XR is a whole level above that, in the light winds able to exceed the wind speed by 20%. 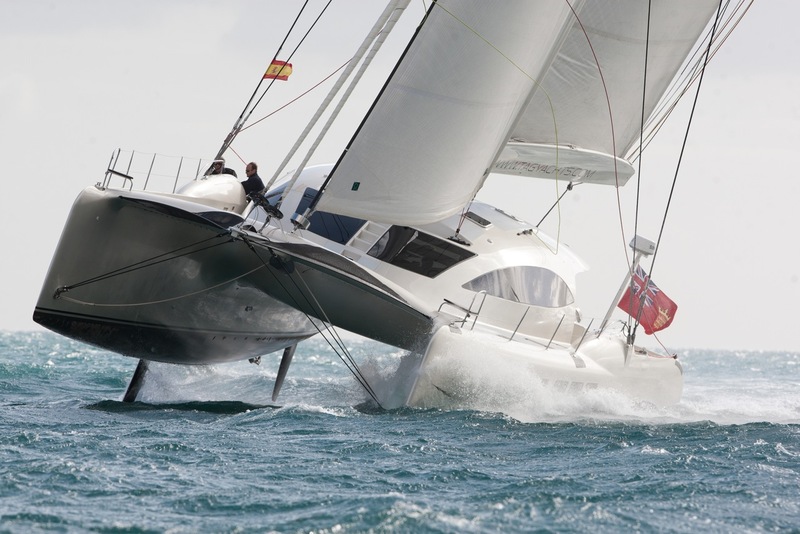 With 13 knots she can fly a hull – get your head around that! That’s Hobie territory…. The TAG 60 is a viable choice for anyone looking at Gunboats etc. If there are features you don’t like on the other high performance cruising Cats (as we will name this genre) then you will find a polar opposite approach on the TAG that just might get the juices flowing. This is an exciting demonstration of Greg Young’s design capabilities that have always marched to a different beat. Kudos to TAG and Greg, you didn’t follow the pack and what has resulted is a truly stunning yacht. I want one.